Global Industrial Boiler Market size, in 2017 was valued over USD 9 billion with annual deployment to exceed 100 thousand units by 2024. Rapid industrialization coupled with ongoing investments toward expansion of manufacturing facilities will drive the global industrial boiler market size. Respective governments across developing economies in conjunction with the global financial institutions have undertaken policy initiatives to promote development of new industrial centers which will further propel the product adoption. Ongoing efforts to reduce greenhouse gas emissions driven by increasingly stringent legislative requirements will stimulate the global market growth. For instance, the European Union has set a target by 2030 to reduce GHG emissions by 40% compared to the 1990 levels which will lead to the replacement of existing high-emission fuel boilers. Shift toward energy optimization will further augment the business growth. 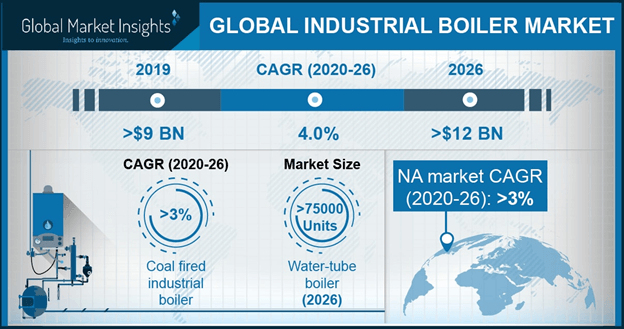 Fire-tube industrial boiler market will witness gains over 3% by 2024. High efficiency, compact design, low maintenance & ownership cost are some of the key features that will make the product adoption preferable over its available counterparts. These units are primarily deployed across pulp & paper, refinery and metal manufacturing industries. 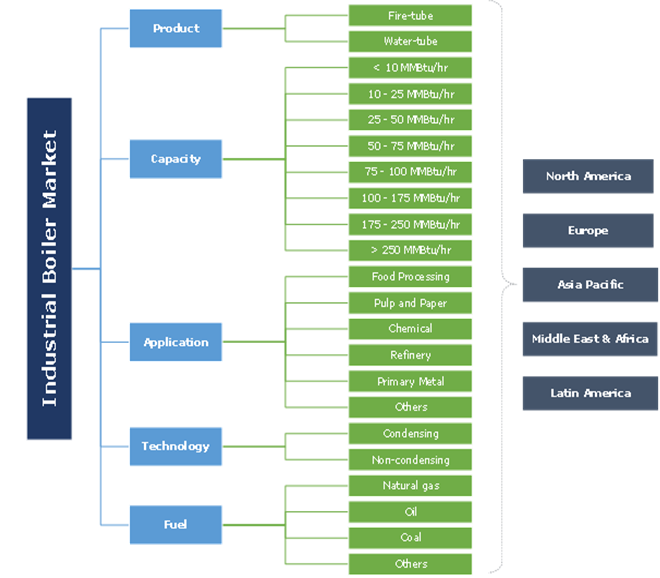 <10 MMBtu/hr industrial boiler market is set to expand over 3% by 2024. Robust industrial sector growth across ASEAN economies comprising Indonesia and Philippines will encourage the product adoption. Expanding food processing sector along with rising demand for energy efficient heating systems across small and medium scale industries will further support the business growth. >250 MMBtu/hr boilers, in 2017 accounted for over 9% of the global market revenue share. Positive outlook toward pulp & paper industry coupled with ongoing expansion of existing refineries will drive the demand for these steam generating units. For instance, in January 2017, the Department of Petroleum Resources (DPR) of Nigeria issued 13 licenses for modular refineries with an aim to expand the country’s refining capacity. Escalating demand for primary metal will further stimulate the product deployment. Global industrial boiler market across chemical sector is set to grow over 3% by 2024. Easy availability of feedstock, rising demand for specialty chemicals and efforts toward adoption of energy efficient systems will foster the business growth. Condensing industrial boiler market is predicted to grow over 4% by 2024. Ability of these boilers to offer high efficiency, low emission, and reduced heating cost makes it preferable over other alternatives. Strengthening government policies to promote the adoption of low-emission systems will further drive the industry growth. Non-condensing industrial boiler deployment will witness growth on account of its ability to withstand wide temperature fluctuations while offering relatively lower operational cost & simple installation. Ability to achieve high operating temperatures along with lower initial cost will further accelerate the product adoption. Gas fired boilers in 2017, accounted for over 26% of the global industrial boiler market revenue share. Stringent government norms pertaining to the adoption of low-emission fuels and legislative mandates toward minimizing the greenhouse gas emissions will drive the product demand. For instance, as per the IEA, under Intended Nationally Determined Contributions (INDCs), the European Union pledged to cut GHG emissions by 40%. Oil fired industrial boiler market is predicted to surpass annual installation of 34,000 units by 2024. Protracted oil price downturn along with ease of resource availability will stimulate the product adoption. Ongoing global efforts to curtail coal consumption across industries will further encourage the product deployment. The U.S. market size is predicted to grow over 2% by 2024. Ongoing investment toward the expansion & modernization of industrial facilities along with reviving economic growth will propel the business growth. Increasing investment across petrochemical & chemical sector will further stimulate the industry growth. For instance, Dow Chemical Co., in 2017, announced investment worth over USD 4 billion by 2022 to expand its petrochemical manufacturing business in the U.S.
Asia Pacific market is anticipated to surpass USD 7 billion by 2024. Burgeoning expansion of manufacturing facilities driven by sizeable investments will foster the business growth across the region. The industry expansion is further attributed to strengthening legislative focus toward reinforcing the region’s industrial sector. Eminent industry participants include Clayton, Cleaver-Brooks, Fulton, IHI, General Electric, Thermax, Siemens, Bharat Heavy Electricals, Forbes Marshall, Cochran and Mitsubishi Hitachi Power Systems. Other industry players comprise AMEC Foster Wheeler, Rentech, Doosan Corporation, Hurst Boiler, Babcock and Wilcox and Bosch Thermotechnology. Industrial boilers are primarily deployed for hot water & steam generation across various industrial sectors including, food & beverage, pulp & paper, primary metals, chemical, refinery and other manufacturing. Rising disposable income, reviving economic growth and growing demand for processed food will positively influence the industry growth.